I made a Lil Cutie Pouch for one of the ladies that I work with. 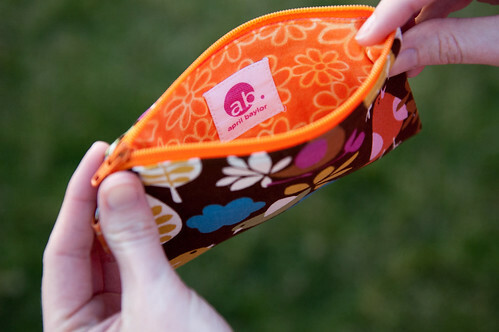 She really liked my tote bag fabric so I made the coin purse in the same fabric, except I used orange for the lining. At first I wasn’t sure if I would like the orange but I do. With each zipper I sew, I feel like it gets easier and I find other little tricks. My newest trick is that my walking foot works better than the zipper foot. It fits right over the zipper and doesn’t shift the fabric as I sew. Who knew a walking foot could be used for so many things! Another zipper tip is to always top stitch; it will help to keep the fabric out of the zipper and I think that top stitching adds more of an overall finished look. Also, I always use a longer zipper than needed and then cut it once it’s sewn to the fabric. This was the first time that I added a label to a Lil Cutie Pouch and I was happy that it wasn’t too large for the small space. I am still using my Spoonflower labels and my only complaint is that I have to fold/iron the edges under so that they don’t fray. Do you have any zipper tips that you want to share with others? 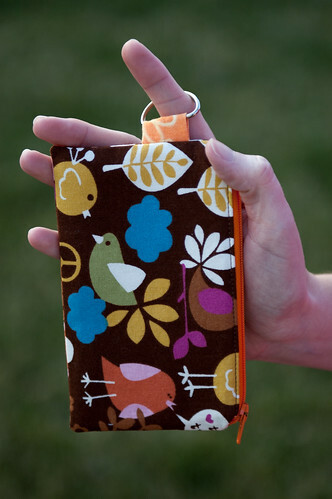 Can you help me at all or point me in the direction of a tutorial to do a similar lined zipper pouch, but with the long AND one short side of the pouch being zippered (like an L along the pouch?). 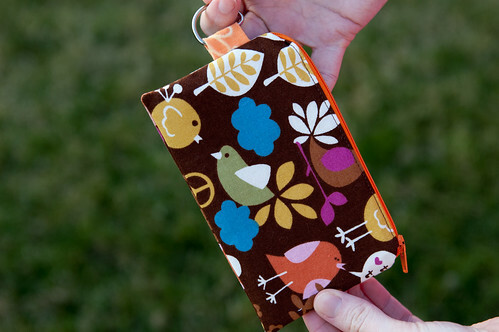 I am looking at a carrier for a phone on a lanyard, but find it too difficult to get the phone out of a classic “coin purse” when it’s ringing, so figure if I could open up another edge it might help.